An aroma or scent can conjure vivid memories of spaces and places, make us happy, make us relive special moments and help us unwind. Smells trigger emotions, and once our olfactory senses have picked up on one, our brains are quick to deliver images that match the association with have to that particular aroma. The smell of lavender will take us on a trip to France’s Provence, or the scent of lemons will whisk us away to the Amalfi Coast, while the smell of roses will transport us to a quaint Cornwall rose garden. Exotic spices will rekindle fond memories of holidays to Marrakesh, while the smell of fresh grass reminds us of spring on a mountain pasture. Olfactory memories are intense and almost always vibrant and vivid. Aroma Naturals by RITZENHOFF—selected aromatic compositions created with precious essences to produce harmonious scents that take you down memory lane. The collection consists of three series: Nature, Luxury and Modern. The Nature collection harnesses the intense scents found in abundance in the wilderness. 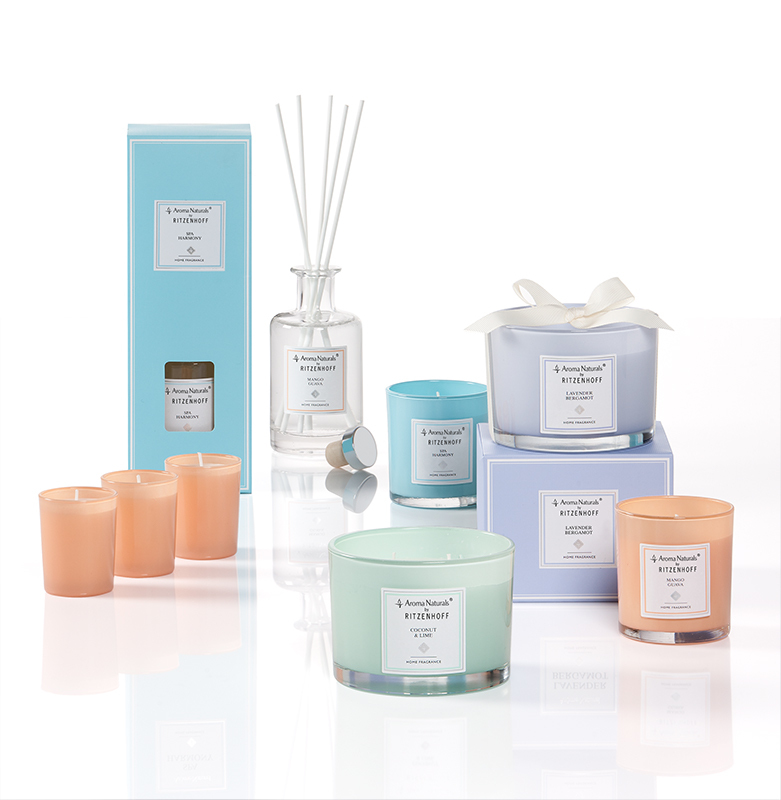 The scented candles come in a glass with a satin finish and a wooden lid, and the beautiful room scent bottle diffusors fit perfectly into any modern country-house style space. The Luxury collection embodies sumptuous, exotic ambience. The scented candles come in a glass with an exclusive metallic finish in copper, gold and silver, and the wonderful room scent bottle diffusors add an elegant and luxurious touch to any space. The Modern collection interprets classic scents in a new fashionable way. The scented candles and diffusors are both reduced and minimalistic in design for a high-quality, modern look. With their pastel-coloured packaging, the Modern collection is a must-have to add a modern and fresh touch to your space.